Additionally, the recent report indicates that golf is responsible for contributing about $3.9 billion annually to charities across the country. Here are some frequently asked questions about this important report. In 2002, Golf 20/20 published its first national report, which demonstrated that golf in 2000 was a $62 billion industry, bigger than the motion picture and recording industries combined. A follow-up report conducted in 2011 reported that golf had grown to a $68.8 billion industry, with a total impact on the U.S. economy in 2011 of $167.8 billion. Additionally, the recent report indicates that golf is responsible for contributing about $3.9 billion annually to charities across the country. In 2006, along with research partner SRI International, GOLF 20/20 developed a template with which individual states can affordably quantify golf's impact on their economy; to date 33 states have used or are currently using this template, and the resulting reports have been successful in establishing golf as a critical cog in the state's economic engine. Who benefits from this study? Everyone who has a stake in the future of the golf industry. 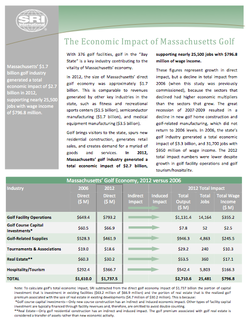 The Economic Impact Studies tells an important story about golf and its importance to the Massachusetts economy. Beyond its sport and recreational value, golf forms the nucleus of a major industry cluster that generates jobs, commerce, economic development, and tax revenues for communities throughout the Commonwealth. This report has been instrumental in educating media, lawmakers and community leaders about our industry to help protect our game for future years.